When waves reach a narrow slit, the water in the slit vibrates like a point source. 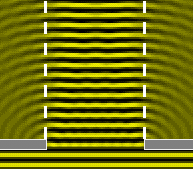 The waves thus sent out from secondary sources along the slit are nearly in-phase when arriving any point in the forward direction. 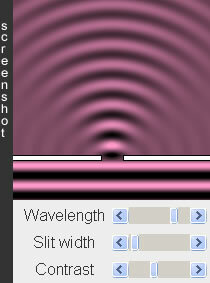 The diffracted wave resembles a circular wave with centre at the slit. 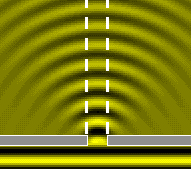 A wave spreads out (noticeable diffraction) when the size of the slit is comparable to or smaller than the wavelength.